Any ideas on how best to use these guys? Looks to me like the Rangers start, move in, attack, switch, and the Ravagers go in the next turn. Or the Ravagers pull out, switch to Rangers and the Rangers can shoot from range later. 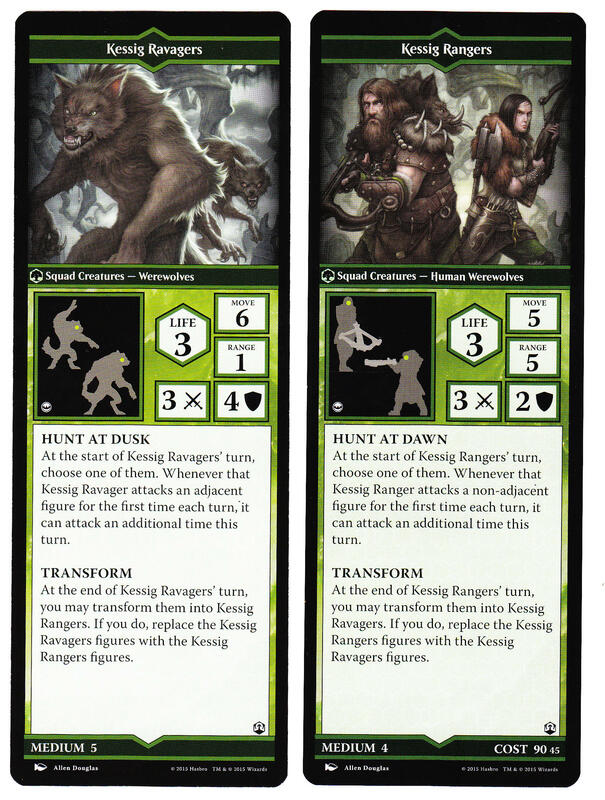 The low-ish range on the Rangers and the higher move on the Ravagers makes it a tough call, IMO. I kind of feel like the Ravagers will generally be more useful. Honestly, In a lot of games you're fine never swapping them from the ranged side. It's so much easier to maintain height/not be in range of their attacks. Basically you just want to dump pump spells onto these guys and then use 'Hunt At Dawn' to double tap units from afar. In both Arlinn and Kiora squads these guys are super nuts. It really depends on the map, If you have to move into a position in where you are going to be attacked more, I flip them to get the bigger defensive bonus. I use the ranged side until I get up in the mix, then they go werewolf and brawl it up. Also a decent strategy for the planeswalker that does the same thing. Having an argument do these guys get two attacks or attack each figure within range? EDIT: So going to reword since I was hoping for a quick answer, but since the game is over I will be more specific. My brother had the kessig rangers in his army. He believed he got to attack each figure in range + one more attack as the card says for the first attack each turn you may attack an additional time. So he argued it is his first attack against that figure so he may attack and get another first attack against the next figure and so on. When I had first read the card I thought it was double attack and the one other game I had played abiut a week ago we treated it as double attack. We got an outside third party who said it was double attack as third party argued the other way seemed too powerful. Did we play it right? Or did we cheat my brother? Btw he won anyway, so he wasn't cheated too much. It looks like one of them may attack one additional time. If ranged. Not both. It says choose one. Yeah, it just gives one of them double attack for the turn. I can see where it would be misunderstood, but at least in Heroscape, for example, powers will always specifically state if they can continue attacking until a certain condition is met (like not inflicting a wound). Here the condition is just the first attack of the turn, the figure is less important. Thank you two for the answer.